Hello everyone. 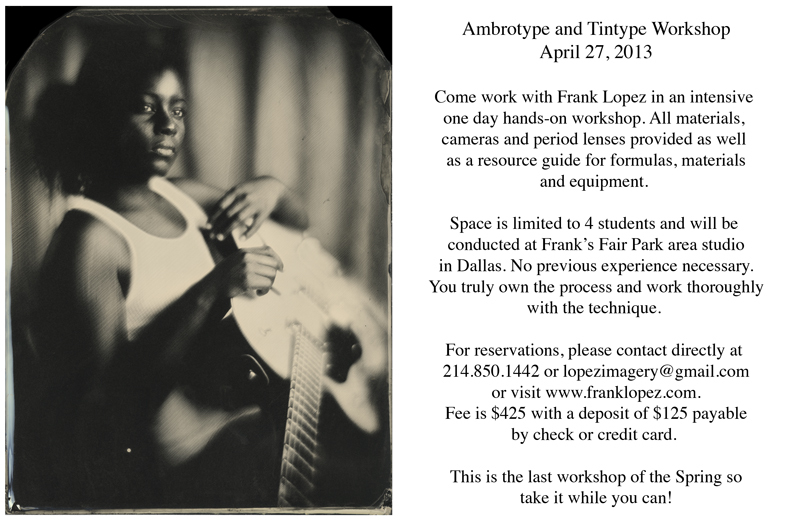 I am teaching my last workshop of the spring on April 27, 2013. I will also be teaching workshops at Cape Cod later this summer as well as a full fall line-up. Please get in touch if you are interested and pass the word along. This is a full detailed workshop with the ability to shoot from 2-4 separate images. Each person has a dedicated camera with a period lens and you learn how to compose, light, clean glass, pour, develop, fix and varnish your plates. You own the process from the ground up and also receive a manual with formulas, suppliers and research from 9 years of research.